The new Sisonke district offices for the Department of Public Works in KwaZulu Natal received a prestigious 5 Star Office Design rating and the Highest Quality Green Star SA Accreditation award form the GBCSA. 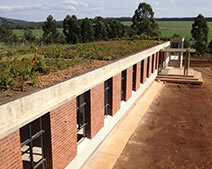 The building is entirely naturally ventilated and does not feature air conditioning systems or fresh air fans. The heavy nature of the floors, walls and ceiling slab provide thermal mass which act as a heating mechanism in winter. Water is heated by a heat-pump and circulated through the walls. The thermal mass of the building is able to store the heat, so the heat pump can use off-peak electricity to reduce costs. At the time of purchase, the site was covered with a mismanaged alien tree plantation that had become infested with alien invasive weeds. 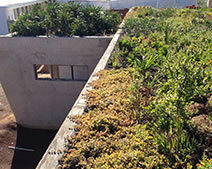 The new office block has an extensive roof garden that is home to nearly 100 indigenous plant species. 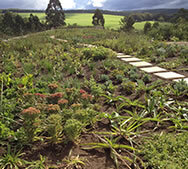 The ecological value of the site was, therefore, improved from its previous condition and the insulation properties of the building were optimised through the roof garden. To reduce energy consumption, the offices are naturally ventilated and 85% of the interior spaces are daylit from natural light, whilst motion sensors automatically switch lights off when no-one is in the spaces. Another important consideration was local sourcing of the building materials, where the face bricks, used in the construction, were sourced within 100 km from the site.